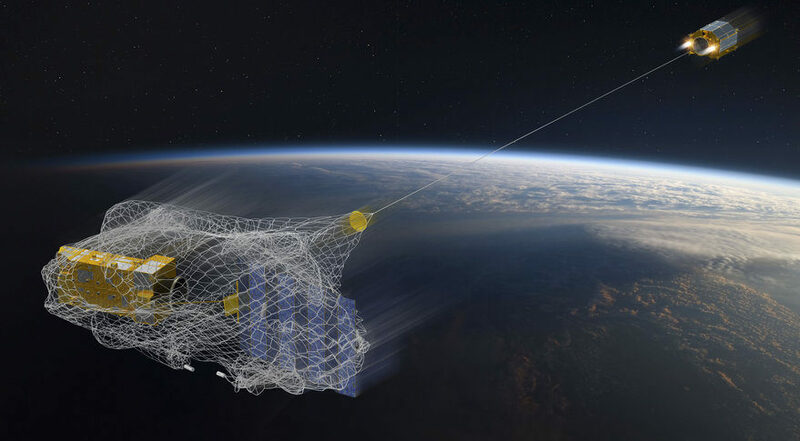 ESA's e.Deorbit mission is developing robotic arms and nets to capture Envisat, the ESA Earth observing satellite that completed its mission in 2012. SAN FRANCISCO – The asuropean Space Agency is no longer proceeding full speed ahead with its campaign to send a 1,600-kilogram satellite into low Earth orbit to grab its defunct Earth observing Envisat and bring it back into the atmosphere around 2023. Instead, the agency has revised its e.Deorbit program plan to study the synergies between the mission and satellite servicing vehicles. “What we are implementing at the moment is a study to find out whether we should modify the mission design to make the vehicle more flexible and able to perform a variety of servicing missions including removing objects from orbit,” said Luisa Innocenti, head of ESA’s Clean Space Office. In parallel with that effort, ESA’s Clean Space Office expects to receive funding of approximately 10 million euros in 2018 to continue to develop robotic arm technologies with many possible applications including satellite servicing and active debris removal. E.Deorbit is part of ESA’s Clean Space Initiative, which promotes environmentally friendly innovation like spacecraft materials and equipment that will burn up completely in Earth’s atmosphere and spacecraft propulsion systems that minimize the amount of propellant needed for atmospheric reentry. The office also emphasizes the importance of the Inter-Agency Space Debris Coordination Committee’s guidelines, which recommend spacecraft in low Earth orbit reenter the atmosphere within 25 years of the end of their missions.